Looking For Professional Wall Mounting in Mount Louisa? Call the Experts at TV Magic Today! 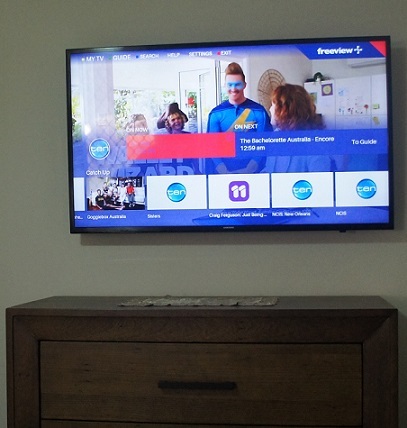 Are you looking for a TV Wall Mounting job in Mount Louisa that is not only practical and functional, but looks amazing as well? TV Magic specialise in the best Wall Mounted TV's and give that special attention to detail that makes all the difference. At TV Magic Mount Louisa we professionally install your TV, set it up and safely Wall Mount it according to our checklist, which ensures that each Wall Mounting job is done correctly and professionally. There are a lot of different service whom you could probably call to come and Wall Mount your TV, however, they won't all do the same quality of job. At TV Magic Mount Louisa, we carefully choose the right bracket for each TV, and ensure that it is strudily fitted to the wall so that you don't end up with any nasty accidents later on down the track. We also make your Wall Mounting job look as neat as possible by tucking the cables back into the wall behind. Many people believe that, if there's nothing wrong with their unanchored TV, then there's no good reason to get an upgrade to having it Wall Mounted. Well you might want to think again. Falling TV's are a major hazard to small children and there are numerous injuries reported every year as a result of children pushing or pulling a TV onto themselves or a sibling. This is not something you want to happen in your household. Wall Mounted TV's are the safest form of entertainment to have in your home as they are secured with strong, reliable brackets that ensure they won't be falling down any time soon. So give TV Magic Mount Louisa a call today, and enjoy peace of mind.